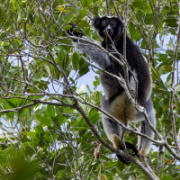 Two national parks between the Madagascan capital, Antananarivo, and the East Coast of the island are the focal point for conserving some of the last remaining prime mid-altitude forests. Andasibe and Mantadia harbour the most accessible populations of the black and white Indri, the largest of all living lemurs. 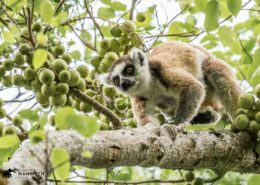 Like much of the rest of Madagascar, to see and experience the wildlife of the east will involve the thrill of a bush walk. There are many miles of trails laid out that transect the different habitats within the incredible forest. You will not only enjoy the simple pleasures of walking through glorious, untouched wilderness, but the diversity of wildlife and endemic species add to the thrill of the adventure. 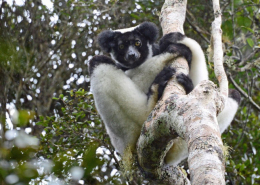 Some of these creatures, such as the larger Indri and Sifakas are usually seen with the aid of your local guides tireless and excellent spotting, and we have wonderful relationships with of the best of the best on the island. It is also the myriad of small things from smaller lemurs to strange tenrecs and exquisite birds that will you spend most of your time looking for and thrilling over when you discover them. Night walks are an enormously fun addition and a great feature of the stays here. On a night walk you will have the rare opportunity to see nocturnal lemurs, frogs and chameleons – some truly unique and special wildlife exploration.